Let me share with you a story. A story about a tea cup and a church. A year or so ago, a small mission church was looking for a permanent home. This mission has a special place in my heart because my husband and I were there when a small group of people started saying prayers together, hoping that God would help establish an Orthodox church in that area. While we were not around to be a part of the fruition of this mission, they are always in my heart. This mission got its name in a most un-orthodox manner. After several months of meetings, several saints were put to the group along with a careful look at the lives of these men and women. When no agreement could be made, my husband suggested that each of the names be scrawled on a piece of paper and placed in a hat. A child was selected to reach in and draw a name. From that drawing, St. Elizabeth the New Martyr was embraced. It seemed so random. And it certainly didn't follow protocol. Fortunately, after His Grace Metropolitan Philip heard the Akathist to Elizabeth prayed, a blessing was given, and somehow this little group got to name their own church! They found a commercial building and began to grow their little community. Soon, a priest was found, one who had a deep heart for Russia, so it only seemed natural that he would serve at St. Elizabeth. Quickly they outgrew their little space and began the search for a more permanent home. A year ago a piece of property was considered. About the same time another priest dear to my heart contacted the parish to say he had found an authentic tea cup belonging to St. Elizabeth through an antiques dealer and his church wished to gift it to the mission. The tea cup which had travelled half way around the world now was driven across the state to be delivered to Fr. John, who at the time just happened to be standing on that little piece of property they wished to buy. The tea cup was handed over on that land. Unfortunately the price of the land was too high, and the search continued. A year passed, and the parish continued to grow. Then a call came, from the property owners of that bit of land. They had heard through mutual contacts that a church was interested in the property, and offered the land at half the original asking price. The land was purchased, but it stands empty until the funds can be raised to build a temple. The ladies of St. Elizabeth, many of whom were the original coordinators of the first Taste and See Cookbook, have now created a second cookbook with the goal of raising money to build that temple. The cookbook is full of all new recipes and will make a great addition to any Orthodox home. The cookbook includes a large number of gluten-free recipes, all clearly marked! To help support St. Elizabeth Orthodox Church in their journey to build a temple on this property blessed by St. Elizabeth herself, I am giving away one copy of the cookbook. Leave a comment to be entered to win, and then if you don't - go buy a copy! I hope I win the cookbook...I'm learning about Eastern Orthodoxy with an eye to considering becoming part of the Church. So, this would be a big help when it comes to fasting. So that is the story of the teacup! Thank you :o) And thanks for this opportunity to win a free cookbook. I have been Orthodox for 6 years, but haven't ever owned a fasting recipe book yet! I would love to! Sounds like a great cookbook, and a wonderful cause! PS. I love reading your posts over at TWTM forums! I hope I win the cookbook! I love your blog, btw, and read it all the time. Thank you for your many thought-provoking posts. St. Elizabeth is our church "home away from home", and we look forward to worshiping in the new church someday. If I don't win, I'll be buying the cookbook. That is a delightful story. Thank you for sharing and please enter me for the cookbook! St. Elizabeth the New Martyr is my youngest daughter's patron saint. I loved reading about the parish of St. Elizabeth. Beautiful story. I love the story of St Elisabeth the New Martyr also. I have a daughter named Elisabeth and she was given the option between this St Elisabeth and St John the Baptist's mother. I have heard great things about the Taste and See cookbook and would love to have a copy. Thank you for sharing that story! As a mission church who will soon be receiving its name, it was very encouraging. Please enter my name in your drawing. I heard about this cookbook on Ancient Faith Radio. I'd love to win a copy! Please enter our family in the drawing.. thank you for the history on it and for the give-away. Thank you for that beautiful story. I would love to win this cookbook. Thank you for sharing that story! I'd love to be included in the drawing! I love your blog! Your schoolroom is awesome. Thank you so much for sharing our story, spreading the word and helping St. Elizabeth Orthodox Church build a building of our own. 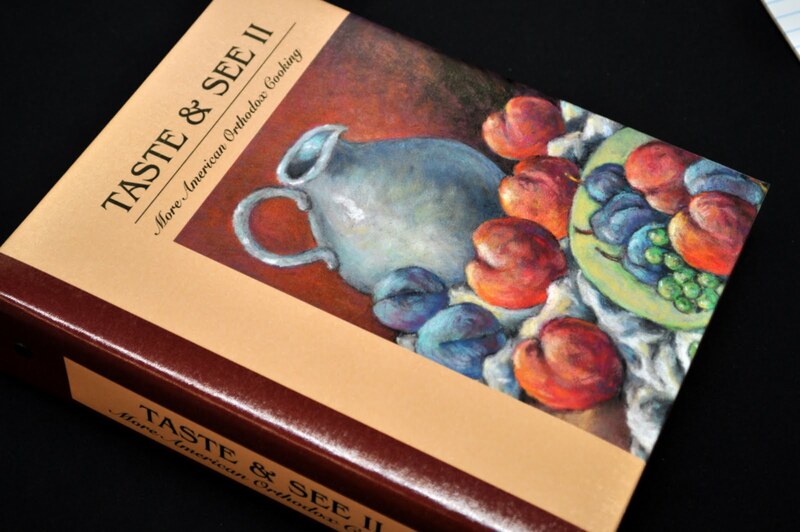 Online ordering for the Taste & See Cookbook is now available through PayPal. Go to www.tasteandseecookbook.com for details. Thanks everyone!!! Also, if people would like to keep up on the latest info on this cookbook project and the St. Elizabeth mission, find us on Facebook at https://www.facebook.com/pages/Taste-See-American-Orthodox-Cooking-Cookbook/150377155016708 and click on the "Like" button. Thanks everyone! That's a really nice story. I hope the mission flourishes and they manage to build a beautiful temple!